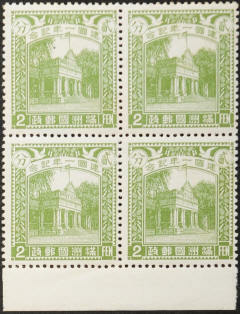 Issued 1st March 1933 to commemorate the first anniversary of the founding of the state. It should be recognised that during the 1930's and 40's stamp collecting had reached its peak and so stamps were a significant provider of revenue for any postal service, this is one reason for the wide range of commemorative issues and special commemorative postmarks in use. 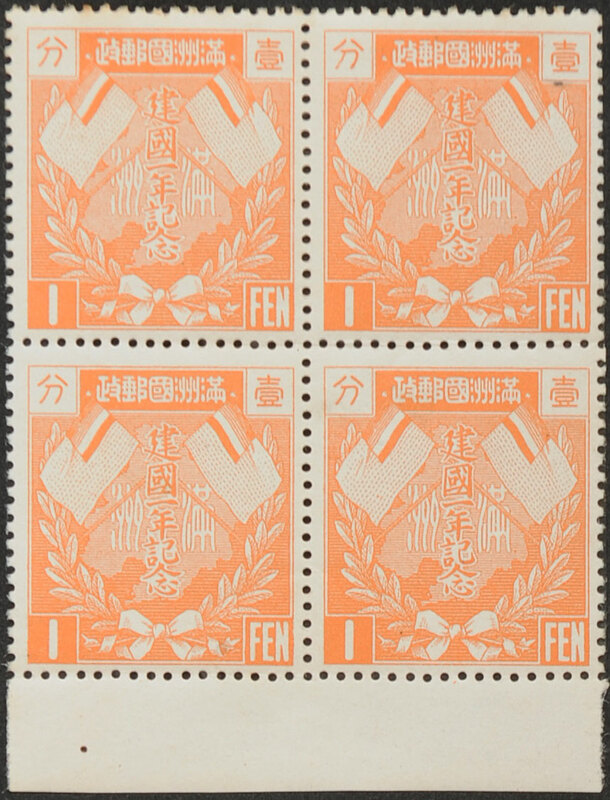 Stamps were also an important propaganda tool and Manchukuo was trying very hard to gain world acceptance as a legitimate sovereign state. 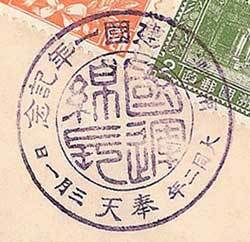 The first set of official picture postcards appeared at the same time, these can be seen here together with a special cancel which appears below. 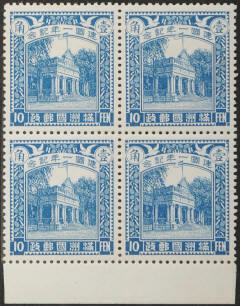 This is a set of 4 stamps lithographed on un-watermarked white paper, originally in sheets of 100. Printed by The Japanese Government Printing Office in Tokyo. Designs by Mr Yutaka Yoshida, Engraving; Map, Aoki Miyakichi; Building, Kato Kurakichi; Lettering, Wakabayashi Sieji. The stamps are 24.3mm x 27mm. Perf 12½. 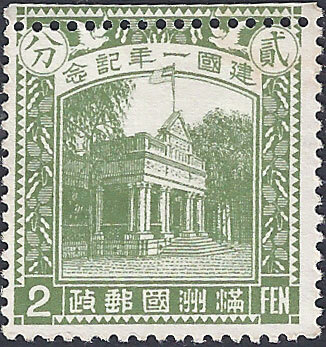 The 1f and 4f depict a Map and the National Flag the remainder of the issue 2f and 10f show the First State Council Hall in the capital Hsinking (previously Changchun City Government Headquarters). 20,000 sets made (1000 sheets per value). 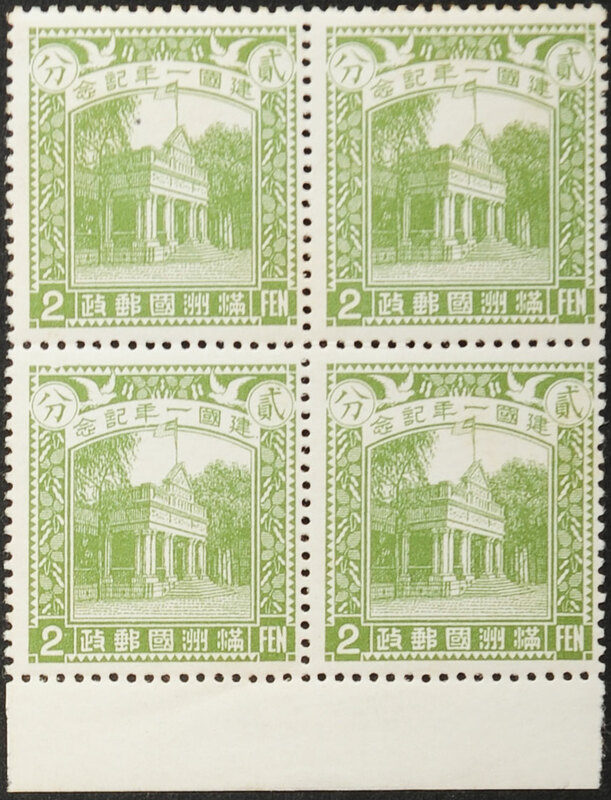 On 10th July 1935 these stamps were re-printed in miniature sheets of 20 (4x5). 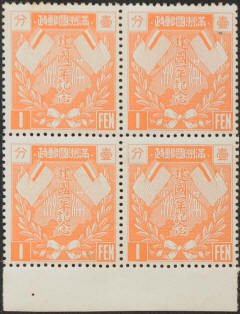 The miniature sheets were made for presentation and exhibition purposes and were not put on general sale for postal use. 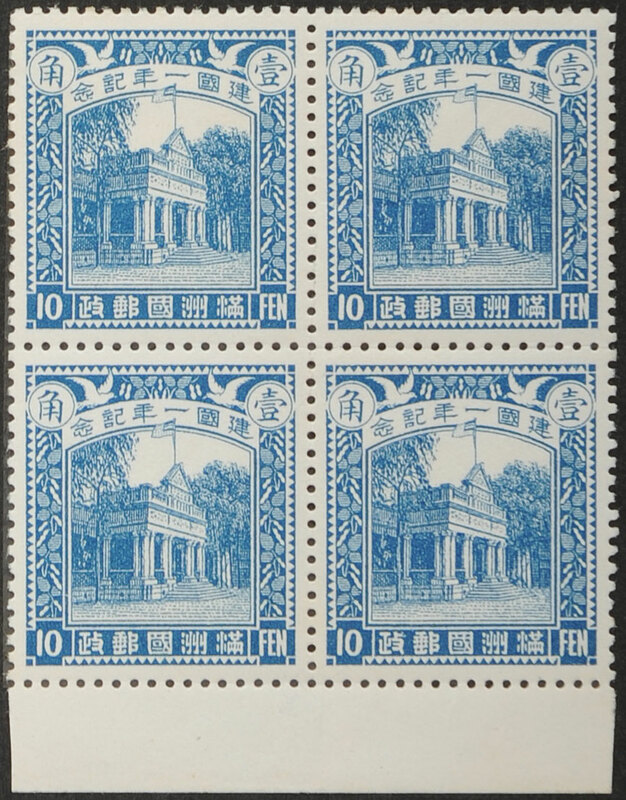 There are minor differences in colour, size, gum, etc., that distinguish these stamps from the originals and copies of these are very scarce. A presentation booklet also exists for this issue. Tied Dove Variety - A thin line joins the breast of the left hand dove to the frame. 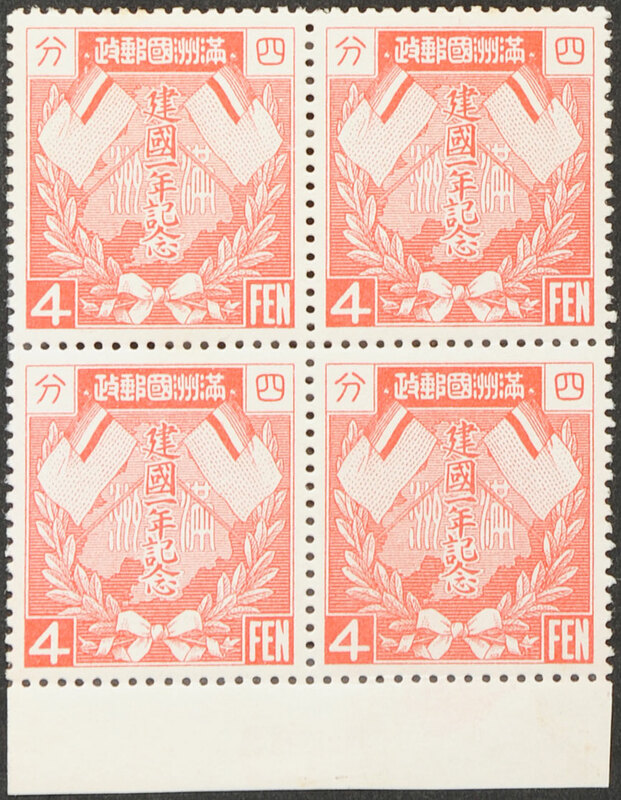 This occurs only on the 33rd stamp of each sheet. 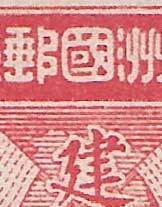 Dented 國 (Kuo) Variety - There is a small nick in the bottom line of the 國 character. Position in sheet unknown. Broken Chiao Variety - A slight nick appears in the lower part of the middle leg of the "Chiao" character. 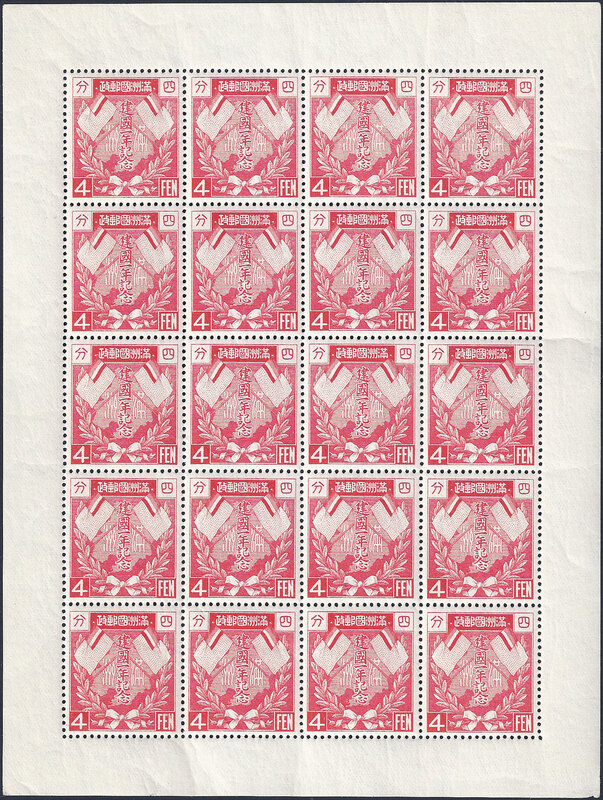 This occurs ten times on stamps 3, 8, 23, 28, 43, 48, 63, 68, 83, and 88 of each sheet. Broken Wing Variety - A blob of blue appears between the wings of the left hand dove. 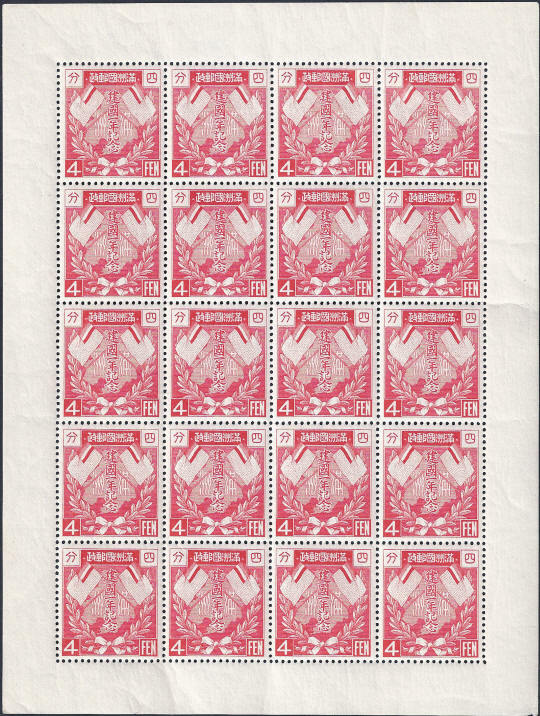 This occurs ten times on stamps 13, 18, 33, 38, 53, 58, 73, 78, 93, and 98 of each sheet. 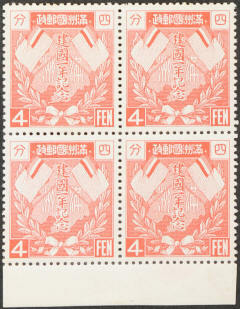 2f and 4f with Perforation Errors. This example was issued in 奉天 Mukden. 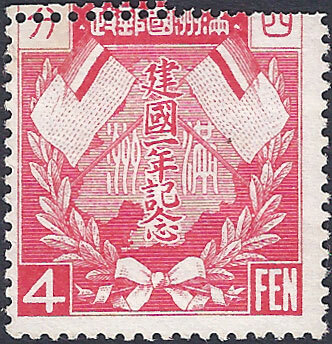 This cancellation celebrates the first anniversary of the founding of the State of Manchukuo with the central characters reading "Perpetuity of Nationhood".